As our storytelling heads into China and its cuisine that often challenges the Western imagination of what is edible versus what is best left for grinding into hotdogs, I can’t help but think about cultural food norms. We encountered plenty of food in China that took bravery and a bit of mental trickery to eat, but we didn’t have to travel to a foreign country to get weirded out by food. There’s plenty to be had at home in San Francisco. Take kombucha, a fermented drink made from the acidic waste liquid of bacteria and yeast. The bacteria forms a gelatinous and surprisingly solid mass that floats on top of the liquid like a deserted island you would never want to inhabit. San Francisco’s health nuts and hippies rave about kombucha’s cleansing, detoxifying benefits, despite speculation that it can poison the liver if over consumed. If you live in San Francisco you’ve probably seen – and smelled – a big jar of kombucha in a friend’s kitchen. Nothing says “health drink” like home-brewed bacteria juice. Sometimes it’s simpler approaches that can throw your mental map of food off its rocker. Our carnivorous friends freak out when we try to take them out for vegetarian or vegan food, even though making vegetables tasty is one of San Francisco’s greatest accomplishments. So we compromise, heading to Golden Era Vegetarian Restaurant. Their fake fish – made from wheat gluten, seaweed, spices, and not a bit of actual sea creature – is so convincing it evokes disturbing thoughts of Soylent Green. During the year Todd and I traveled, artisan ice cream spread through San Francisco like The Blob, if the Blob was made of full-fat cow milk. Even on cold, rainy days, tourists and locals queue at Humphry Slocombe for questionable ice cream flavors like fois gras, salt and pepper, prosciutto, or government cheese. While you’re there, be sure to pick up some lard caramels, a pork fat candy like no other. Then there are eyeball tacos, or tacos de ojos, served fresh and hot from a little window at Tacos Mexicali in the Mission District. 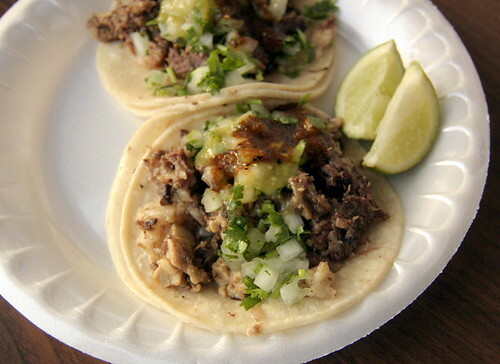 It’s a dish that I haven’t been brave enough to try – yet – even though the tacos are served within easy walking distance from my house. Rumor has it that the cow eyeballs are fatty, flavorful, and a little gelatinous, which sounds like an ideal taco filling, especially with some spicy salsa. What are some questionable edibles you’ve found in San Francisco? Let us know in the comments! This just goes to show you how far people will take craze and fad diets, and how ludicrous and naive some of these San Fransiscan health aficionados can be. Webb J. Kombucha tea–what’s brewing? Drug Information Perspectives 1995;15(2):7-8. Srinivasan R, et al. Probable gastrointestinal toxicity of Kombucha tea: is this beverage healthy or harmful? Journal of General Internal Medicine 1997;12:643-4. 1. my brother bought us some of those lard caramels for christmas. they smelled like meat but tasted like candy. it was disturbing. he also gave us spreadable salami from boccalone. it was not disturbing. 2. there is an old chinese fable that goes like this: kidnappers will serve a child a fish in order to know how much ransom to request. if the child eats the fish’s eyeball, they know to ask for big bucks because only a rich, pampered kid would be allowed to eat the most treasured part of the fish. this is why i never eat the fish’s eyeball: to save my parents some dough. Oh, that kombucha drink sounds disgusting. 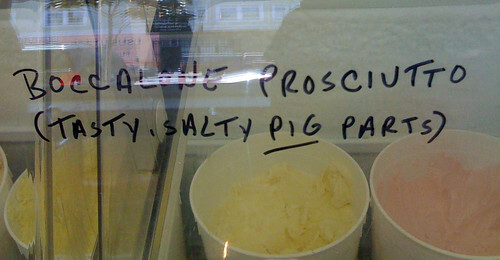 I think I can stomach those questionable ice cream flavours, just for the novelty of it. I can even try the eyeball tacos since in many Asian cultures, eyeballs (fish, animal) are a delicacy. The gluten fish, I actually like, even though I am not a vegan / vegetarian. But that kombucha looks absolutely gross. It’s up there with the Philippines’ balut! Lauren– I see a future here for you, writing abt Bizarre Foods in San Fran. As usual, your descriptions capture the essence of the foods, yet keep me reading on. Don’t book reservations at the eyeball restaurant for us on our next visit; not sure I can visualize eating them.